wachusettdumpsterrental: Question of the week: How much space do I need for a dumpster rental to fit on my property? Question of the week: How much space do I need for a dumpster rental to fit on my property? It can be hard to visualize a dumpster rental based simply on the dimensions and measurements. Our dumpsters have the footprint of a minivan and fit into a standard size parking spot. All of our equiptment is built to be residential friendly. This means that our dumpster and our trucks can fit snug up to your property, into tighter spots, and close to your project at hand. So if you have a narrow street or driveway, no need to worry! Don't be afraid to ask questions if you don’t know something — We will answer anything you throw at us. Please give us a call or contact us online and we can discuss your project needs. 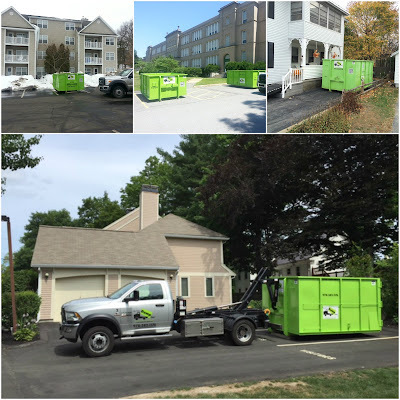 This blog is helpful and informative with its content on dimensions and measurements of dumpsters trucks; we also provide dumpster on rent and share information on dumpster rentals. It is appreciable the information you shared here, thanks for sharing this blog. Please visit Action Roll Offs.